Check out this great article by Great Lakes Boating magazine that discusses the benefits of new PlasDECK Eco Series! “How would you like to get half off regular price for alternative teak boat decking? 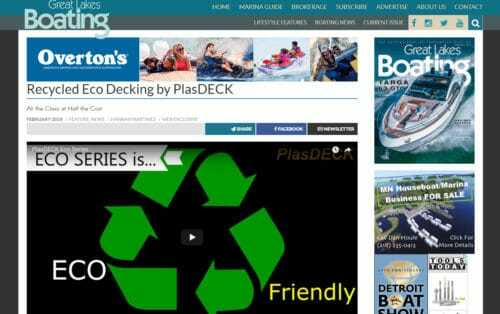 In the past year PlasDECK has developed and started supplying a new line of boat decking products made from recycled production scraps. According to PlasDECK’s international sales coordinator, Jennifer LittleBear, customers pay up to 50% less than they would buying the original decking material. Alternative PVC-based teak boat decking is less expensive than real wood but still considered a higher end product, according to LittleBear. The decking material typically lasts for the life of the boat. Boaters don’t have to worry about discoloration, maintenance or mold/mildew growth on the synthetic teak. It is also less slippery than real teak and there is no need for tedious polishing and hardwood maintenance. Boat owners have several practical reasons for choosing teak alternatives, but why choose PVC-based decking rather than Eva foam, which is cheaper? Appearance and durability are the two main considerations for investing in PlasDECK. The new Eco Series is modeled after the PlasDECK product, available since 2006. “It looks exactly the same on top,” said LittleBear, “From the top it’s the exact same color, the exact same texture, the only difference is that layer of black underneath it.” The black underlayer of the Eco Series provides contrast to enable custom engraved panels, similar to Eva foam. Longevity of the new product is untested, but has a five-year warranty like the original product. “It’s made out of the exact same material, so it has the same great additives, high UV protection that our standard product has,” said LittleBear. Unlike similar products, the patented formula used to create PlasDECK has stabilized oils that don’t leak, create cracks or weaken the adhesive. Click here to view the full article on the GLB website!